What happened to Jesus when he died? And what will happen to me when I die? These two perennial Christian questions are the foci of Matthew’ Levering’s new book, Jesus and the Demise of Death: Resurrection, Afterlife, and the Fate of the Christian(Baylor University Press, 2012). 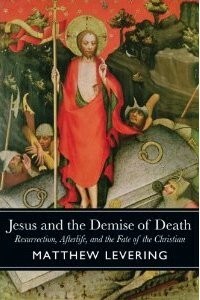 In this deceptively brief but remarkably rich study of Christian eschatology, Levering puts contemporary scholarship on the fate of Jesus—his descent into hell, bodily resurrection, and ascension into heaven—and the fate of the Christian—the existence and immortality of the soul, resurrection from the dead, and beatific vision—into dialogue with the profound and subtle eschatology of St. Thomas Aquinas. The result is a fascinating entrée into what Scripture, tradition, and contemporary exegetical, theological, and philosophical discussions have to say about the mystery of the grave and what lies beyond it. Although the book is replete with flashes of insight, several highlights stand out. First, Levering’s fundamental contribution is to show that when it comes to the question ‘What happens to me when I die?’, Christian eschatology must not take its eyes off Jesus of Nazareth. In order to know what will happen to us after death, we must look carefully at what Scripture reveals about the paschal mystery of Jesus. This connection between the fate of Jesus and the fate of the Christian, though basic, is of critical importance. For one thing, it acts as a corrective to those currents of thought—especially popular in modernity—that are overly apophatic (if not agnostic) about personal eschatology. When it comes to the mystery of death, Christian theology is by no means left in complete darkness. Nor does it need to turn primarily to the anecdotal evidence of Near Death Experiences or to private mystical phenomenon of more or less questionable authenticity for answers to questions about what lies beyond the grave. Rather, a robustly Christian eschatology looks first and foremost to Jesus Christ as the one whose Passover “from death to life” (John 5:24)—the descent of his living (but disembodied) soul to the realm of the dead, his resurrection to bodily but unending life, and his bodily ascension into the heavenly glory of the Trinity—reveals the truth about the fate of the Church as a whole and the individual Christian in particular. In a word, authentic Christian eschatology must be a Christological eschatology. Second, given this Christological framework, Levering’s book is significant for the stress that it puts on two particular doctrines: the descent of Jesus’ disembodied soul into “hell” (as professed in the Apostles’ Creed), and the existence of the spiritual soul of the individual Christian after death. As Levering demonstrates, both of these doctrines have fallen on hard times of late, with modern theologians proposing profoundly incompatible theses about what Jesus did or not do while in the realm of the dead (e.g., N. T. Wright, Hans Urs von Balthasar) and contemporary philosophers and exegetes casting doubts about the very existence of the individual soul, much less whether it continues to exist in the intermediate state between death and resurrection (Nancey Murphy, Joel Green). With regard to the fate of Jesus’ soul, Levering argues that his descent into hell is not merely about the eschatological triumph over death. In a remarkable convergence of modern scholarship and medieval theology, Levering shows how Aquinas’ theology of Jesus’ descent corroborates the emphasis of contemporary exegetes on the hope for the eschatological restoration of Israel. For Aquinas, Jesus descends to the dead precisely in order to liberate the “holy Israelites” of the old covenant era and lead them to the heavenly promised land. Using the language of N. T. Wright, Jesus’ descent truly begins “the end of exile”—but not by means of ageographical restoration to the earthly land of Canaan. Rather, Jesus’ descent is about theeschatological return of God’s people from the spiritual realm of the dead to the Paradise once lost. In the words of the prophet Zechariah: “Because of the blood of my covenant with you, I will set your captives free from the waterless pit” (Zech 9:11). Third and finally, Levering’s book is commendable for the way in which it holds together the distinct hopes for the beatific vision of the souls in heaven and the bodily resurrection of the dead. In keeping with is method so far, Levering interprets both of these in the light of Jesus’ bodily ascension into heaven and the ultimate restoration of the redeemed to bodily life and beatific vision at the end of time. Indeed, the final discussion of bodily resurrection and beatific vision in Chapter 7 is worth the price of the book. It is one of the more curious aspects of modern Christian eschatology that it often tends to choose to emphasize either the resurrection of the body—as a restoration to a life not unlike the life of this world, though perfected—or the beatific vision—which is already experienced now by the disembodied souls of the faithful departed in heaven. By contrast, Levering, following Aquinas, refuses to choose between bodily resurrection and beatific vision, but holds them (eternally) together. By means of his insistence on placing Christian eschatology within a Christological framework, Levering emphasizes that the climax of Jesus’ paschal mystery was not his resurrection but his bodily ascension into heaven. As the ascension of Jesus makes clear, the resurrection of the body is not an end in itself, just as this world—even made new—is not an end in itself. Instead, both humanity and cosmos are ultimately ordered toward the life of the Trinity, of the one God who is “spirit” (John 4:24) and yet who will restored the material cosmos in such a way that it is not annihilated but made new in a “ new heaven and new earth” (Rev 21:1-5).